Site Description: The recreation site is managed as a day use only recreation site. No overnight camping is permitted. Irish Lake is popular for fishing, bird viewing, and canoeing and kayaking. Boaters should be aware that power-driven vessels are prohibited on this lake under the Vessel Operation Restriction Regulations (Transport Canada). Electric motors are permitted. Driving Directions: From 100 Mile House travel south on Hwy 97. Turn east onto Hwy 24 towards Lone Butte. 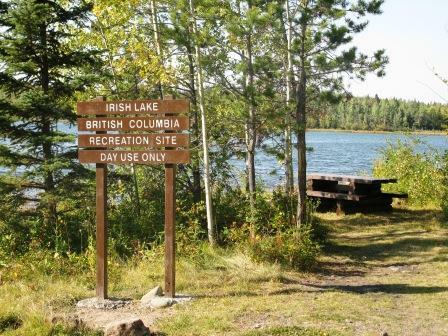 Travel approximately 13.7 km along Hwy 24 (about 3 km past Lone Butte) and turn right to access Irish Lake. Travel 300 meters and turn right. Travel another 600 meters to the recreation site.